Originally published in Journal of Creation 15, no 2 (August 2001): 94-102. According to the theory of sexual selection, the peacock tail has gradually evolved because the peahen selects beautiful males for mating. The peacock tail contains spectacular beauty because of the large feathers, bright, iridescent colours and intricate patterns. The colours in the tail feathers are produced by an optical effect called thin-film interference. The eye pattern has a high degree of brightness and precision because the colour-producing mechanisms contain an extremely high level of optimum design. According to the theory of sexual selection, the peacock tail has gradually evolved because the peahen selects beautiful males for mating. However, there is no satisfactory explanation of how the sexual selection cycle can start or why the peahen should prefer beautiful features. In addition, there is irreducible complexity in both the physical structure of the feather and in the beautiful patterns. Most birds have two types of tail feather: flight feathers and tail-coverts. The flight feathers provide stability during flight, while the tail-coverts ‘cover’ and protect the tail region. In the vast majority of birds, the tail-coverts are small feathers, just a few centimetres long. However, some birds like the peacock have very large tail-coverts for decorative purposes. These decorative feathers are also referred to as ornamental feathers, or display feathers.1 It should be noted that a peacock is a male peafowl and a peahen is a female peafowl. The peahen does not have any decorative feathers. When a peacock displays his tail feathers during courtship, a magnificent ‘fan formation’ of feathers forms a beautiful backdrop to the body of the peacock as shown in Figure 1 (below). An adult peacock has an average of 200 tail feathers and these are shed and re-grown annually. Of the 200 or so feathers, about 170 are ‘eye’ feathers and 30 are ‘T’ feathers. The ‘eyes’ are sometimes referred to as ocellations. Figure 1. Peacock with tail feathers displayed. This paper describes some of the complex structures that are responsible for producing the beautiful features and why the beauty of the peacock is evidence for intelligent design. The paper also describes the theory of sexual selection and shows that there are serious problems with the theory. One reason for the beauty of the displayed feathers is that they form a semi-circular fan over an angle of more than 180 degrees. 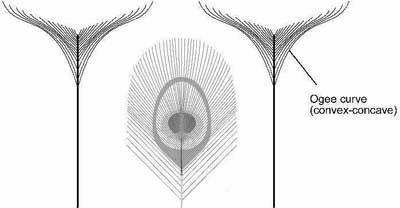 The fan formation is very even because the axis of every feather can be projected back to an approximately common geometrical center. The radial alignment of feathers requires the root of each feather to be pointed with a remarkable degree of accuracy. Another remarkable feature of the displayed feathers is that they are ‘deployed’ into position by muscles in the peacock’s tail. Not only can the peacock deploy the feathers, but he can also make them vibrate and produce a characteristic hum. Another beautiful feature of the displayed feathers is the uniform spacing of the eyes. Even though the display contains around 170 eye feathers, they are all visible and all spaced apart with a remarkable degree of uniformity. All the eyes are visible because the feathers are layered with the short feathers at the front and the longer feathers at the back. The eyes have an even spacing because each feather has the right length. Each ‘eye’ feather and ‘T’ feather is an object of outstanding beauty in itself. The eyes contain beautiful patterns, and the ‘T’-shaped feathers form a beautiful border to the fan. Figure 2. Structure of the eye feather. The bright colours and intricate shapes of the eye pattern are the most striking aesthetic features. The loose barbs on the lower part of the feather are beautiful because they make a contrast with the neatness and precision of the barbs in the eye pattern. The last three features in the list above are usually only noticed by very careful observers. However they represent important ‘finishing touches’ which make an important contribution to the beauty of the feather. The absence of a stem in the top half of the eye is an important detail because it prevents the pattern from being divided into two sections. The stem is not needed because the barbs fan out around the top of the feather. The narrowness of the stem in the bottom half of the eye pattern is important because this makes the stem fairly obscure. The stem can be narrow because it has a deep section in the area of the eye pattern. The brown coating of the stem in the area of the eye pattern is very important because the stem is a natural white colour and this would be too conspicuous for the eye pattern. It is interesting to note that the stem is white everywhere except local to the eye pattern. This strongly indicates that the brown coating near the eye pattern is a deliberate feature. The colours in the peacock tail are particularly beautiful because they are bright and iridescent. An iridescent colour is a colour that changes with the angle of view. The colours are not produced by pigments but by an optical effect called thin-film interference that takes place in the barbules.4 In technical terms, the peacock has ‘structural colours’. In the eye pattern, the barbules appear bronze, blue, dark purple and green. Away from the eye region, the barbules are uniformly green. 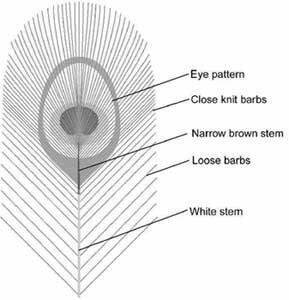 The colours in the eye feather can only be seen on the front surface of the feather because this is where the barbules are positioned. The back of the feather is uniformly brown because the barbs contain a brown pigment. To understand how thin-film interference is produced in the peacock tail, it is first necessary to understand the detailed structure of the feather. The colours of the barbules dominate the front face of the tail feather because they completely cover the barbs. The barbules are not very visible from the back of the feather because the barbs are quite close together. Thin-film interference can be produced in one or more layers of a very thin and transparent material. Usually the thin film is placed on a dark surface. The thickness of the transparent material must be close to the wavelengths of visible light. Visible colours have wavelengths between 0.4 and 0.8 µ and thin films typically have a thickness of between 0.3 and 1.5 µ. Another requirement for thin-film interference is that the thin film must have a refractive index that differs from air so that the light is retarded when it passes through the thin film. Thin-film interference commonly occurs in oil slicks on a wet road. The oil will often form a thin layer on the wet surface of the road or on the surface of a puddle, the thin-film producing blue and green colours. Figure 4. Cross-section of peacock barbule. The principle of thin-film interference in a single layer of keratin is shown in Figure 4. White light is reflected off the front and back surfaces of the thin film. The light which passes through the keratin is retarded and therefore when it emerges from the keratin, some of the colour components of white light are out of phase with the light-waves that were reflected from the front surface. When two wave trains of the same colour are out of phase, destructive interference removes the colour. In the case of white light, the result of the interference is a reflected colour due to the remaining colour components of white light. In practice, interference occurs simultaneously in all three thin films. The only pigment in the peacock tail is melanin, which gives the barbs a uniform brown colour. This provides a dark background colour for the thin-film interference in the keratin layers. The different colours in the eye pattern result from minute changes in the depth of thickness of the keratin layers.8 In order to produce a particular colour, the keratin thickness must be accurate to within about 0.05 µm (one twenty thousandth of one millimetre!). The particular beauty of the eye pattern comes from the rounded shapes that have a high degree of resolution as shown in Figure 5 (below). The ‘pupil’ of the eye is formed by a dark purple cardioid and the ‘iris’ is formed by a blue ellipsoid. These shapes are located within a pointed bronze ellipsoid that is surrounded by one or two green fringes. Figure 5. Mathematical curves in the eye pattern. A very important feature of the eye pattern is that it is a digital pattern which is formed by the combined effect of many thousands of individual barbules. Some patterns in nature are formed by natural growth mechanisms, as with the spiral shape of the nautilus shell. However, the eye pattern in the peacock tail requires the precise coordination of independent barbs and this cannot be achieved by a simple growth mechanism. Barbules on adjacent barbs coordinate perfectly with each other to produce the eye pattern. The spacing of colours on each barb must be specified by instructions in the genetic code. To specify the pattern, there must be timing or positional instructions in the DNA which causes the right thickness of keratin to be grown on the right barbule and on the right barb. To help appreciate the precise nature of the information in the genetic code, it is helpful to consider the mathematical complexity involved in calculating the required spacing of colours on each barb. Figure 6. Intersection points on barbs. Figure 6 (right) shows the colour spacing on a single barb. Along the first part of barb ‘n’, the thickness of the keratin films on the barbules gives a bronze colour. Then an abrupt and minute change in thickness of the keratin films produces a blue colour. Another abrupt and minute change in thickness of the keratin films so produces a bronze colour. 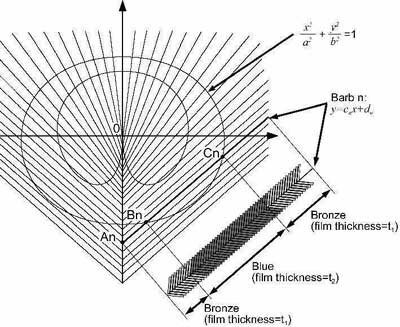 The abrupt nature of the changes in thickness is important because if the changes were gradual then there would be a gradual change in colour.11 The abrupt changes in thickness of keratin along a barb are an amazing feature because it involves sudden and precise changes in the dimensions of the barbule. Even more amazingly, along the length of the barb the thickness of the keratin does not continually get thicker and thicker (or thinner and thinner) but it involves both increases and decreases in thickness. A similar procedure can be used for the intersection points on the cardioid shape and the outer green fringes. For each barb there are on average about four points at which colour changes and so there are on average four positions to calculate. Since there are around 50 barbs on each side of the pattern and since every one of these barbs has a unique spacing of colour, it is necessary to calculate 200 intersection points in order to construct the whole eye pattern. The long ‘T’ border feathers provide a beautiful border to the tail feathers because they form an inverse shape to the peacock eye as shown in Figure 7 (below). An inverse shape is beautiful because the inside profile of the T feather follows the outline of the eye pattern. 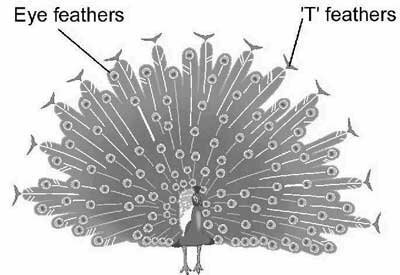 The T feathers often form an ‘ogee’ curve on each side of the feather as shown in Figure 7. An ogee curve is beautiful because it is both concave and convex. For this reason, ogee curves are used in architecture in structures such as arches. The formation of an ogee curve from individual barbs is yet another remarkable feature of the peacock tail. Each barb at the end of the T feather has a unique length and curvature and all the barbs coordinate exactly with each other to form the curved T.
Figure 7. The 'T' feathers and 'eye' feathers. Every detail in the peacock tail must be defined by genes in the genetic code of the peafowl. Since the tail feathers have very complicated structures and colour-producing mechanisms, there must be a large amount of design information in the genetic code. It is difficult to determine how many genes would be required to specify the aesthetic features of a peacock tail feather because it is not known how the tail feather grows. However, a conservative estimate can be made by assuming that each separate aesthetic feature is specified by one gene. By assuming that each colour and each shape within the eye pattern represents a separate feature, and taking into account the other features discussed in this paper, the total number of aesthetic features in a single feather comes to about 20. Therefore an estimated 20 genes are required for the peacock tail. This may be a very conservative estimate. 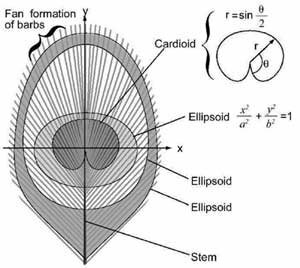 In particular, it may be that many genes are required to produce each shape in the eye pattern since the eye pattern is formed from the coordinated arrangement of over 100 barbs. In addition, the fanning-out of barbs in the top of the feather, where there is no stem, is a complex feature that may well need several controlling genes. Even if only 20 genes are required to specify the beautiful features of the peacock tail, this still amounts to a lot of genetic information. A gene typically consists of 1,000 chemical units of information (base pairs). Therefore, 20 genes would contain many thousands of chemical units of information. According to evolutionists, all of this information has appeared gradually by genetic mistakes and by sexual selection. According to sexual selection, a female can have a preference for a mate with a feature such as a long tail. Over a long period of time, sexual selection is believed to be able to develop a particular feature to a great extent. For selection to work, a number of things are thought to be typically required. Firstly, the male must have an aesthetic feature. Secondly, the female must have a preference for that particular aesthetic feature. Thirdly, the female must be able to have the opportunity to view a number of different males before mating. Fourthly, the female must be able to have some control over which male mates with her. Evolutionists recognize that a female such as a peahen does not have aesthetic appreciation and that the preference of the female is based on an instinctive response. In addition, it is recognized that the instinctive response needs to be specified by one or more genes in the genetic code15 called preference genes. Do the peacock tail feathers play a role in the courtship ritual? There is no doubt that the peacock tail feathers do play a role in the courtship ritual of peafowl. Many creatures have a courtship ritual that acts as a cue for mating. In the case of the peafowl, the peacock shows his intention to the peahen by displaying his feathers. However, even though the display feathers have a role in the courtship ritual, this does not necessarily mean that the female is ‘attracted’ to the feathers. When the peahen observes the feathers of the peacock, it may be that her only reaction is to understand that the peacock is ready for mating. Of course, the beauty of the peacock tail display is vastly beyond what is required to make a cue for the peahen. However, it is the Creator’s prerogative to design a cue that is vastly more complicated than what is required. One could argue that the courtship ritual is an appropriate place to install great beauty because courtship is a beautiful process in itself. Do preference genes exist in the peahen? Biologists have carried out studies on the behavior of peafowl during courtship to try to determine if the peahen is really attracted to particular features of the peacock. One study has revealed that peahens do recognize obvious features in the peacock such as the number of eye feathers.16 The results of this study indicated that the peahen prefers males with a greater number of eyes. However, other studies have indicated that the peahen has little or no interest in the appearance of the peacock.17 There is no evidence that peahens can recognize subtle aesthetic features. If there is a preference gene for aesthetic features, this does not prove that the sexual selection theory is true. If there is a preference gene for aesthetic features, this does not prove that the sexual selection theory is true. The reason for this is that the Creator may have installed a preference gene as a means of ‘maintaining’ beautiful features. Beauty generally gives a disadvantage in terms of escaping from predators. If a peacock lost its colours due to a gene mutation, it would suddenly find itself more protected from predators. This is an example of where a loss of information could be a great advantage in terms of survival. Therefore, it is conceivable that the Creator would deliberately create preference genes for prominent aesthetic features such as colour. Even in the case of subtle aesthetic features, it is conceivable that the Creator may have created preference genes in order to root out genetic mistakes. However, there would be less selective pressure for subtle features to be lost since they do not affect the ability of the peacock to escape from predators. (i) Why should the female select a ‘beautiful’ feature? When females have a preference, that preference becomes self-perpetuating.18 However, there is no reason a fashion should always be a ‘beautiful’ fashion. According to evolution, preference genes appear by totally random processes and therefore there could be a fashion for all kinds of features including ugly features. In reality, where males have decorative features, such as the birds of paradise and the peafowl, it is clear that every aesthetic feature contains a very high degree of aesthetic merit. To overcome the problem that females always prefer beautiful features, evolutionists have proposed the ‘good genes’ theory that proposes that beauty is directly related to health and fitness.19 However, the decorative features found in nature are so overwhelmingly beautiful that it would require an extremely strong correlation between beauty and health and there is no evidence for such a strong correlation. (ii) How can the sexual selection cycle start by chance? Another big problem with the theory of sexual selection is the question of how the sexual selection cycle can start by chance. The cycle cannot start until there is both a trait gene and a preference gene. Therefore for a sexual selection cycle to get started there must be the appearance of two new genes in the DNA. Since genes contain complex information and since the preference gene and trait gene are useless on their own, it must be concluded that sexual selection could never spontaneously commence on the basis of incremental changes to the DNA. To overcome the problem of the simultaneous appearance of two new genes, evolutionists have proposed that the two genes appear at different places and different times in the following way.20 First, a female spontaneously produces a preference gene for a male with, say, a long tail. This gene lies dormant for perhaps many generations without any opportunity to be expressed. Then one day, a male spontaneously generates a gene which produces a longer tail. The female then selects that male and some of their offspring have both the trait gene and the preference gene. Therefore, the cycle is in place and ready to develop and perpetuate long tails. At first, this scenario may seem plausible. However, it still relies on simultaneous chance events. Firstly, there must be a preference gene that matches a trait gene. Secondly, there must be a chance meeting between the right female and male. The first gene to arise also has to survive genetic drift until the male gene arises. 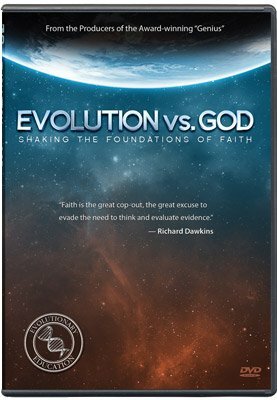 Therefore, even with the scenario given by the evolutionists, it is clear that the sexual selection cycle is extremely unlikely to get started. (iii) How can multiple aesthetic features start by chance? The starting of one sexual selection cycle is difficult to explain by chance. However, when a creature contains many separate aesthetic features, the problem becomes even more pronounced because many cycles must be started. In the case of the peacock, there are many aesthetic features in the tail. In addition, the peacock also has several aesthetic features in the rest of its body. For example, it has a bright blue neck, patterns around the eyes, a crown on the head and speckled contour feathers. This array of features would probably require many sets of preference genes and trait genes. (iv) How can the female appreciate subtle features? It may well be possible that a peahen has a preference for obvious features such as a long tail. However, there are some extremely subtle features in the peacock which are not easy to recognize. These subtle features include an absence of a stem in the upper part of the eye pattern, the brown colouring of the stem near to the eye pattern and the intricate shape of the ‘T’ feathers. It may be reasonable to argue that a peahen could recognize whether a peacock had lost its eye feathers or T feathers. However, to discern subtle changes in these feathers would require tremendously detailed observation. The above features are so subtle that many people do not notice them. In addition, it is necessary to get quite close to the feather to recognize such features. Since peahens do not undertake close visual inspections of the peacock, they would have to have a much better eye for detail than a human being in order to recognize the subtle features of the peacock tail. Darwin himself recognized the problem of subtle aesthetic features. Darwin said, ‘Many will declare that it is utterly incredible that a female bird should be able to appreciate fine shading and exquisite patterns. It is undoubtedly a marvellous fact that she should possess this almost human degree of taste’.21 What is really incredible is that evolutionists really believe that a peahen is able to recognize fine shading and exquisite patterns. There is no evidence that the peahen can recognize such subtle aesthetic features. Since evolution is supposed to work by changing one parameter at a time, thin-film interference cannot be produced by a process of evolution. For example, if there was a random gene mutation that suddenly caused a barbule to become flat, this change would not be enough to cause thin-film interference. Even if a barbule were to become flat and acquire a layer of keratin, this would still not produce a thin-film colour unless the keratin was the right thickness. Getting the right thickness of keratin by chance is very difficult because the keratin thickness has to be within a very narrow range for thin-film interference to work. For thin-film interference to work, the thickness of keratin normally has to be within a range of 0.4–1.5 µ. However, keratin can be formed in thicknesses from 0.2 µ up to 1 mm. For example, nails and feather stems have keratin with a thickness of around 1 mm. If one considers 1,000 different layers of keratin which all have a different thickness ranging from 1 µ, 2 µ, 3 µ, etc., all the way to 1,000 µ (1 mm), only one or two out of the thousand thicknesses would produce thin-film interference. Therefore, it is inconceivable that a peacock could acquire a flat barbule and exactly the right thickness of keratin simultaneously. The only way to produce iridescent feathers is to make a fully functioning flat thin-film barbule from the beginning. This is an important quote because Mason’s studies on the colour of peacock feathers are referred to by most modern texts on bird coloration. Notice how the author refers to the ‘perfection of nature’s method’, and marvels at how the thin-film is maintained in successive generations. If it is hard to understand how the peacock ‘maintains’ its delicate structures through successive generations then how does the evolutionist explain how it could have evolved in the first place? According to evolution, a complex pattern like the eye pattern in the peacock’s feather has evolved by the accumulation of hundreds of genetic mistakes occurring over vast periods of time. However, patterns like the blue ellipsoid in the eye are irreducible, i.e. they require several features to be simultaneously present in order for there to be a clear pattern. If only one barb in a peacock tail feather was to have a patch of blue colour this would not produce a beautiful pattern. Such a random change would arguably cause the peahen to deselect, not select the pattern. Since evolution requires every step change to have a selective advantage, the eye pattern cannot evolve but must be designed complete from the beginning. Some evolutionists believe that males like the peacock compete with other males in order to win a privilege of mating with a female.23 It is believed that the competition can be based on the beauty of a display. The idea is that the male with the most impressive display frightens the other males into submission. A major problem with this theory is that it cannot explain why there should be subtle aesthetic features. Some evolutionists claim that the peacock tail gives a camouflage advantage.24 The reason they believe that camouflage plays a role is that the peacock train (i.e. undeployed tail feathers) is mostly green and supposedly provides camouflage when it hides in trees. However, the theory of camouflage also has serious problems. Firstly, the tail makes the peacock more conspicuous on the ground, which is arguably where the greatest danger is to be found. Secondly, camouflage does not explain how the subtle eye patterns could have evolved. Thirdly, if the function of camouflage were really effective then the peahen should also have such a tail. Some evolutionists believe that the colour and pattern of the peacock tail has the sole function of making the peacock recognizable to the peahen.25 However, this theory cannot begin to explain the origin of the subtle aesthetic features of the peacock. Figure 8. Added beauty in a column. The beauty of the peacock tail can be termed ‘added beauty’ because it appears to be surplus to that necessary to survive. In other words, the beauty of the peacock tail is not a by-product of the function of the tail. Added beauty can be a powerful evidence of design because it is a common hallmark of an intelligent designer. The hallmark of added beauty can be seen in all kinds of human design. For example, an architect often adds decorative features to the different parts of a building. 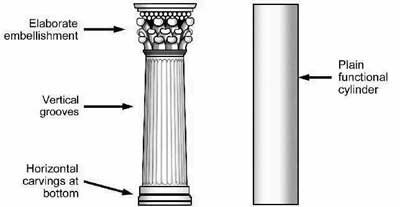 The adding of beauty to a column is illustrated in Figure 8 (left), which compares a classical column with a plain functional cylinder. The decorative features of the classical column have the sole function of providing a beautiful spectacle. But they also present evidence that an intelligent designer has designed the column. So also the added beauty of a peacock tail reveals an intelligent designer. There are many beautiful features in the peacock tail such as bright iridescent colours, intricate patterns and the fan-formation of the displayed feathers. The mechanisms that are responsible for producing these beautiful features are very sophisticated. In particular, the barbules contain an astounding level of precision design in order to produce optimum thin-film interference. 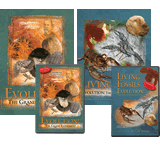 There are several serious problems with the evolutionary theory of sexual selection. There is no satisfactory explanation of how the sexual selection cycle can start or why the peahen should prefer beautiful features. In addition, there is irreducible complexity in both the physical structure of the feather and in the beautiful patterns. Darwin once said, ‘The sight of a feather in a peacock’s tail, whenever I gaze at it, makes me feel sick!’28 If Darwin knew about the modern discoveries re the complexities of the peacock tail, he would have even greater reason to feel sick. In contrast, when Christians look at the tail of the peacock they can feel a wonderful assurance that there is a Creator who is infinite in wisdom and that the Creator has been very good to mankind in putting such beauty into the world. I would like to thank Des O’Neil from Bristol University for taking pictures of the barbules under the microscope. Some of the peacock display feathers have a few centimetres of fluffy barbs at their root to perform the function of thermal insulation. However, the fluffy barbs are such a minor detail that the description of ‘display feather’ is generally used by biologists. King, A.S. and McLelland, J., Birds—Their Structure and Form, Bailliere Tindall, p. 15, 1984. Sager, E., Morphologishce Analyse der Musterbildung beim Pfauenrad, Revue Suisse de Zoologie, Geneve 62(2):116, 1955. Mason, C.W., Structural colours in feathers II, J. Physical Chemistry 27:440, 1923. Marshall, A.J. (Ed. ), Biology and Comparative Physiology of Birds, Academic Press, London, p. 225, 1960. Darwin, C. The Descent of Man, John Murray, London, p. 412, 1871. Cronin, H., The ant and the peacock, Cambridge University Press, Cambridge, Great Britain, p. 118, 1991. Darwin, C., The Descent of Man, John Murray, London, p. 349, 1888. Andersson, M, Sexual Selection, Princeton University Press, Princeton, p. 336, 1994. Clarke, D. (Ed. ), Wildlife Fact File, International Publishers Ltd, London, 1972. Dawkins, R., The Blind Watchmaker, Penguin, London, p. 199, 1986. Quoted from: Cronin, p. 183. Burgess, S.C., Hallmarks of Design, Day One Publications, Epson, Surrey, 2000. Darwin, F., (Ed), Letter to Asa Gray, dated 3 April 1860, The Life and Letters of Charles Darwin, John Murray, London, Vol. 2, p. 296, 1887; 1911 Edition, D. Appleton and Company, New York and London, Vol. 2, pp. 90–91.